This collection corresponds to the third quarter of the first year set of My Bible First lessons. This special Teacher's Edition allows you to make copies for certain types of uses. 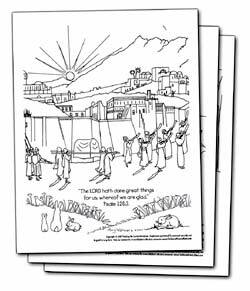 These 13 beautiful coloring pages correspond to the 1st Year 3rd Quarter lessons from My Bible First: The Forgotten Happiness Rule, How We Love Others, Broken Promises, A Dwelling Place for God, God's Beautiful Sanctuary, Nadab and Abihu, Two Brave Spies, Rebellion in the Wilderness, A Sad Mistake, Balaam the Greedy Prophet, The Promised Land at Last, Blessings and Curses, The Gibeonites. 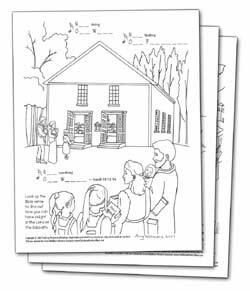 These coloring pages are in the .pdf format, the same as is in our free collection of coloring pages, however these are much higher quality and will take a little longer to download. We believe that you will think that the extra quality is worth the wait.